Canada Food Guide:what is unlikely to change as new evidence emerges? Note: This article is mainly a Science Made Simple article with some personal comments and rhetorical questions added in, so it is categorized as both an editorial and a Science Made Simple article. To me, a natural reading of the statement seemed to indicate that the Guidelines are unlikely to change in the foreseeable future as new evidence emerges. That is, the subject of the statement is Guidelines 1 and 2 —which are said to be based on convincing findings supported by well-established evidence base and unlikely to change in the foreseeable future as new evidence emerges. I thought that it couldn’t say what I understood it to say and asked myself what else it could have meant. Perhaps Health Canada meant to say that they considered the evidence-base so strong that it was unlikely to change in the foreseeable future, even as new scientific evidence emerges. In this context, it is clear that it is the “convincing findings” that are supported by a “well established evidence-base” on which dietary guidance is based that Health Canada believes are unlikely to change in the foreseeable future as new scientific evidence emerges . 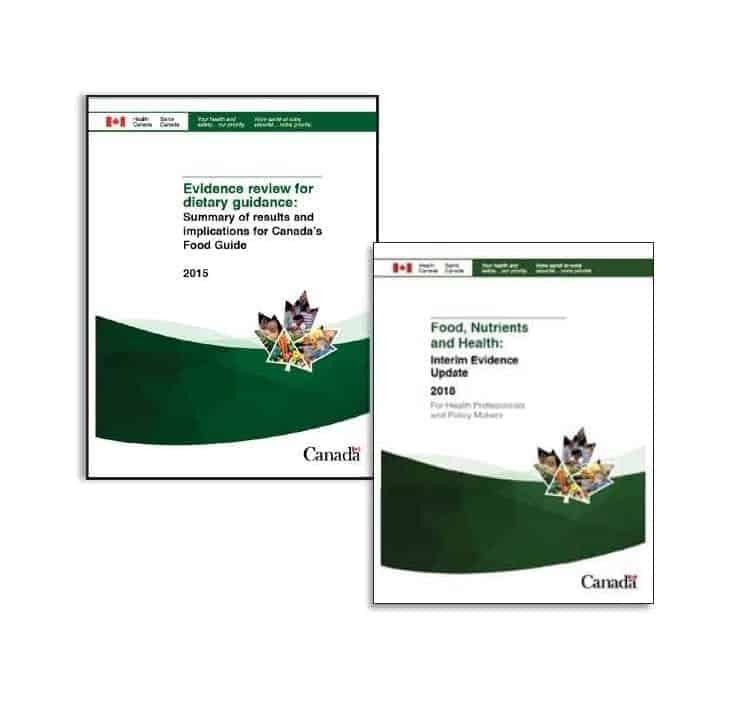 “Health Canada will update Canada’s dietary guidelines, as needed, to ensure the guidance remains consistent with the latest convincing evidence” . According to Health Canada, the findings are supported by such a well-established evidence-base that they are “unlikely to change in the foreseeable future, even as new evidence emerges”. [Rhetorical question: is the evidence-base for recommending that Canadians limit saturated fat intake really so strong that it is “unlikely to change in the foreseeable future as new evidence emerges”? As I elaborate on below, in 2015 the Heart and Stroke Foundation of Canada already questioned the link between saturated fat and cardiovascular disease in their updated position paper (a paper, that I elaborate on below was not included as a reference in the new Canada Food Guide). In addition, the 2017 PURE epidemiological study that Health Canada references in their 2018 paper but does not cite (see below) did not find that dietary saturated fat intake was associated with cardiovascular disease. Furthermore, a meta-analysis published just last week (months after the release of the new Canada’s Food Guide) of 43 cohort or nested case-control studies that were conducted up until July 1, 2018 did not find that higher saturated fat intake was associated with higher risk of cardiovascular disease (CVD) events. In my opinion, the presupposition that new evidence is unlikely to change an old, “well established evidence base” assumes that the relationship between blood lipid values (such as LDL) and cardiovascular disease is almost indisputable. Current evidence does not seem to support this. This brings me to two questions that I have about Canada’s Food Guide’s evidence-base for Guideline 1 (the recommendation to consume plant-based protein more often because it results in lower intake of foods that contain saturated fat). My questions relate to two references that seem to me to be conspicuous by their absence. BACKGROUND: Health Canada’s Interim Evidence Update 2018  lists the 2016 World Health Organization (WHO) reports by Mensink (# 56, below) and Brouer (#57, below) and both of these reports are used as a basis for developing Canada’s Food Guide. Reference 58 which is the 2017 Prospective Urban Rural Epidemiology (PURE) study by Souza, RJ, Mente A Maroleanu A et al, is listed in Health Canada’s Interim Evidence Update but is noticeably absent from the table (Annex 3) in the document and is not referenced in Canada’s Food Guide. The PURE study was largest-ever epidemiological study which recorded dietary intake in 135,000 people in 18 countries over ~ 7.5 years, in low- medium and high income countries and which found that increased saturated fat intake was not associated with increased rates of cardiovascular disease. QUESTION: Why is the PURE study omitted from the table, but is listed in the References? BACKGROUND: Table 2 of What are Canada’s Dietary Guidelines? titled “convincing findings supporting Guideline 1” lists 5 additional reports in addition to the 2010 FAO/WHO report and the two WHO reports from 2016 and 2017 on which this Guideline was based. One of these five is the American College of Cardiology/American Heart Association report of 2013. 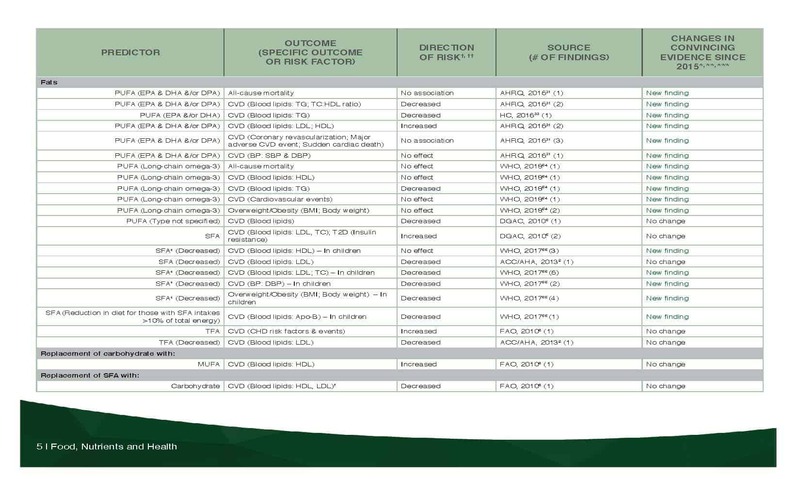 QUESTION: Why was the Canadian Heart and Stroke Foundation position statement titled “Saturated Fat, Heart Disease and Stroke“ released in September 2015 omitted from Table 2 of What are Canada’s Dietary Guidelines? when it it is both; (a) Canadian and (b) several years more recent than the American Heart Association position statement of 2013 which was used in place? Here is an excerpt from the Canadian Heart and Stroke Foundation position statement titled “Saturated Fat, Heart Disease and Stroke“ released in September 2015. I have highlighted sections of interest in red and put their references directly below, so they can be looked up. HEALTH EFFECTS OF SATURATED FATS Research over several decades clearly indicates that saturated fats raise low density lipoprotein cholesterol (LDL-cholesterol) in the blood[4,10,11,15]. Research also indicates that elevated LDL-cholesterol is a risk factor for heart disease and stroke, and that lowering LDL-cholesterol decreases cardiovascular morbidity and mortality. However, epidemiological studies provide a mixed picture of the association between saturated fatty acids and cardiovascular disease (heart disease and stroke) [15-22]. Early studies found an association between cardiovascular disease and saturated fat [23,24] while more recent studies have found no such association [18,21]. These mixed findings have been the focus of recent scientific debate, and underscore that the health effects of saturated fats are complex. Studies investigating the effects of replacing saturated (animal) fats with plant oils and unsaturated spreads (mono- and poly-unsaturated fats) have found that this dietary change results in improved cholesterol levels and reduced risk of cardiovascular disease [5,25,26]. Research further indicates that modifying the type of fat we eat seems to protect us better if we adhere to the changes for at least two years. Dietary recommendations to reduce overall fat intake have also included recommendations to replace saturated fats with carbohydrates. In retrospect, this advice may have played a role in increased calorie consumption and contributed to increased rates of obesity and metabolic syndrome . Studies that have looked at the individual fatty acids (i.e. lauric, stearic, myristic and palmitic acids) have found that individual saturated fatty acids may have different effects on blood cholesterol levels[4,15]. The food source from which the saturated fat is derived may have different effects on cardiovascular risk [20,22]. Additional studies are required to determine whether cardiovascular risks are influenced by the nutrients used to replace saturated fats (i.e. carbohydrates, monounsaturated fatty acids or polyunsaturated fatty acids), the types of saturated fat  and/or the foods in which they are consumed. 4. Food and Agriculture Organization of the United Nations (FAO). Fats and fatty acids in human nutrition: Report of an expert consultation 2008. Rome, Italy: 2010. 5. Mozaffarian D et al. Effects on coronary heart disease of increasing polyunsaturated fat in place of saturated fat: a systematic review and meta-analysis of randomized controlled trials. PloS Med 2010;23:7(3):e1000252. 6. Ramsden CE et al. Use of dietary linoleic acid for secondary prevention of coronary heart disease and death, evaluation of recovered data from the Sydney Diet Heart Study and updated meta-analysis. BMJ 2013;346:e8707. 7. de Oliveira Otto MC, Mozaffarian D, Kromhout D, et al. Dietary intake of saturated fat by food source and incident cardiovascular disease: the Multi-Ethnic Study of Atherosclerosis. Am J Clin Nutr 2012;96:397-404. 9. Moubarac JC, Batal M, Bortoletto Marins AP, Claro R, Bertazzi Levy R, et al. Processed and ultra-processed food products: Consumption trends in Canada from 1938 to 2011. Can J Diet Pract Res 2014;75(1):15-21. 10. Department of Health and Human Services, US Department of Agriculture. Dietary Guidelines for Americans 2010. http://www. health.gov/dietaryguidelines/2010.asp. Updated 2012. 11. American Heart Association Nutrition Committee. Lichenstein AH, Appel LJ, et al. Diet and lifestyle recommendations revision 2006. A scientific statement from the American Heart Association nutrition committee. Circulation 2006;114:82-96. 12. The Fifth Joint Task Force of the European Society of Cardiology and Other Societies on Cardiovascular Disease Prevention in Clinical Practice (constituted by representatives of nine societies and by invited experts). European guidelines on cardiovascular disease prevention in clinical practice (version 2012). European Heart Journal 2012;33:1635-1701. 13. Vannice G, Rasmussen H. Position of the academy of nutrition and dietetics: dietary fatty acids for healthy adults. J Acad Nutr Diet 2014;114(1):136-153. 14. National Cancer Institute. Risk factor monitoring and methods: Table 1. Top food sources of saturated fats among the US population, 2005-2006. NHANES. 15. Micha R, Khatibzadeh S, Shi P, Fahimi S, Lim S, Andrews KG, et al. Global, regional and national consumption levels of dietary fats and oils in 1990 and 2010: a systematic analysis including 266 country-specific nutrition surveys. BMJ 2014;348:e2272. 16. Mensink RP, Zock PL, Kester AD, Katan MB. Effects of dietary fatty acids and carbohydrates on the ratio of serum total to HDL cholesterol and on serum lipids and apolipoproteins: a metaanalysis of 60 controlled trials. Am J Clin Nutr 2003;77:1146-1155. 17. Mente A, et al. A systematic review of the evidence supporting a causal link between dietary factors and coronary heart disease. Arch Intern Med 2009;169(7):659-669. 18. Chowdhury R, Warnakula S, Kunutsor S, Crowe F, Ward HA, Johnson L, et al. Association of dietary, circulating and supplement fatty acids with coronary risk: A systematic review and meta-analysis. Ann Internal Medicine 2014;160:398-406. 19. Ravnskov U, DiNicolantonio JJ, Harcombe Z, Kummerow FA, Okuyama H, Worm N. The questionable benefits of exchanging saturated fat with polyunsaturated fat. Mayo Clinic Proceedings 2014;89(4):451-53. 20. O’Sullivan TA, et al. Food sources of saturated fat and the association with mortality: a meta-analysis. Am J Public Health 2013;103:e31-42. 21. Sri-Tarino PW, Sun Q, Hu FB, Krauss RM. Meta-analysis of prospective cohort studies evaluating the association of saturated fat with cardiovascular disease. Am J Clin Nut 2010;91(3):535-546. 22. de Oliveira Otto MC, Nettleton JA, Lemaitre RN, et al. Biomarkers of dairy fatty acids and risk of cardiovascular disease in the Multi-Ethnic Study of Atherosclerosis. J Am Heart Assoc 2013;2:e000092. 23. Hu FB, Stampfer MJ, Manson JE, et al. Dietary fats and the risk of coronary heart disease in women. New England Journal of Medicine 1997;337:1491-1499. 24. McGee DL, Reed DM, Yano K, Kagan A, Tillotson J. Ten-year incidence coronary heart disease in the Honolulu Heart Program. Relationship to nutrient intake. Am J Intern Med 2014;160:398- 406. 25. Hooper L, Summerbell CD, Thompson R, Sillis D, Roberts FG, Moore HJ, et al. Reduced or modified dietary fat for preventing cardiovascular disease. Cochrane database of systematic reviews. 2012 issue 5. 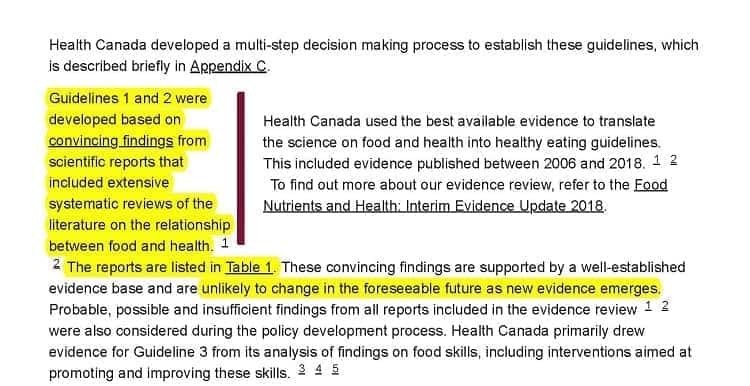 Health Canada has based the new Canada Food Guide on what they consider ‘convincing findings’ that are supported by a ‘well-established evidence-base’; findings that they believe are unlikely to change in the foreseeable future as new evidence emerges. As stated several times in previous articles, for those that are metabolically healthy, the new guide is a huge improvement over the previous one as it focuses on eating real, whole food and avoiding sugar-laden drinks including fruit juice, and processed foods that are high in both fat and carbs. My main concern, as elaborated on in several previous posts is the effect of a high carbohydrate diet (even if those carbohydrates are unrefined) on the large percentage of Canadians who are metabolically unwell. My other concern is the further limiting of healthy, whole foods such as meat, seafood, cheese and milk because they contain saturated fat, when mixed research findings indicate that the relationship between saturated fat intake and cardiovascular disease is complex. Guideline 2 to limit processed foods is fantastic and benefits all Canadians, however in my opinion, recommending that Canadians across the board limit animal based protein foods because the saturated fat they contain may predispose them to cardiovascular disease is not based on robust data. Furthermore, it unnecessarily limits foods that are the best sources of the most bioavailable sources heme-iron (outlined in this article in relation to the plant-based Eat-Lancet Diet) as well limits some of the richest sources of B-vitamins (as outlined in this article). How does one sort through all this information and make sense of these recommendations in relationship to themselves? As part of my complete assessment, I not only ask about how you usually eat and your food preferences, and weigh and measure you, I also review your most recent lab work to determine whether you fall in the large percentage of Canadians that are no longer metabolically healthy, or don’t. From there, we’ll discuss the various options you have for improving your weight and metabolic markers so that you can decide what is the best approach for you. You can learn more about my services and their costs above under the Services tab or in the Shop and if you have questions about these, please feel free to send me a note using the Contact Me form above, and I will reply as soon as I can.To your good health! Copyright ©2019 The LCHF-Dietitian (a division of BetterByDesign Nutrition Ltd.) LEGAL NOTICE: The contents of this blog, including text, images and cited statistics as well as all other material contained here (the “content”) are for information purposes only. 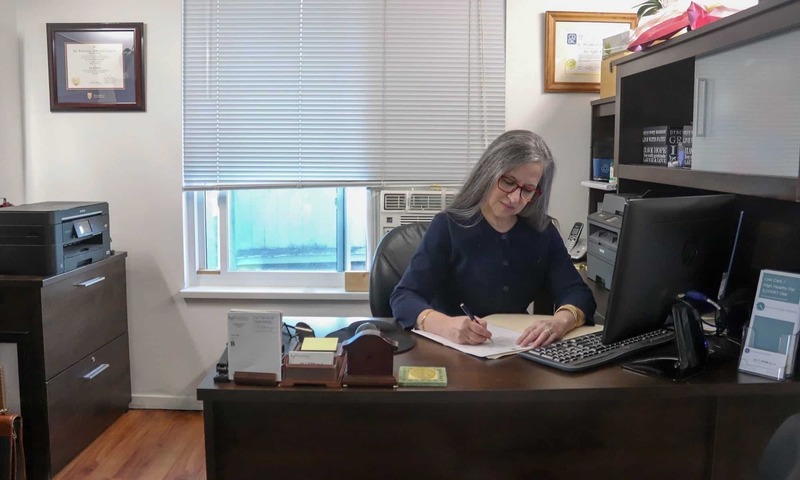 The content is not intended to be a substitute for professional advice, medical diagnosis and/or treatment and is not suitable for self-administration without the knowledge of your physician and regular monitoring by your physician. Do not disregard medical advice and always consult your physician with any questions you may have regarding a medical condition or before implementing anything you have read or heard in our content. Previous PostPrevious But Low Carb Diets Eliminate an Entire Food Group!